This procedures manual has been prepared as the ﬁrst in a series of such manuals intended to provide clear, technical guidance on the various stages of implementing a Reduced Impact Logging strategy in the lowland and hill dipterocarp forests of Indonesia. 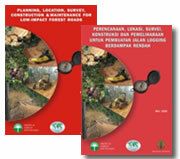 This manual provides implementation detail consistent with existing forest policy and regulation in Indonesia. From a technical perspective, however the principles and procedures described in this manual can also be applied to similar forest management conditions throughout Southeast Asia and Paciﬁc region. This is the third edition of this manual published by the Tropical Forest Foundation (TFF) and endorsed by the Association of Indonesian Forest Concession Holders (APHI). Funding for the publication of this edition has been provided entirely by the TFF. Funding for preparation of the original manual was provided by the International Tropical Timber Association (ITTO). The focus of this manual is RIL planning. This manual takes the user through the basic planning requirements which make up the Ministry of Forests (MoF) regulatory framework, through to the details of operational logging planning which are necessary to effectively implement an RIL operation. 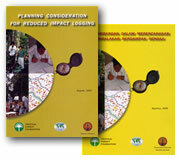 This procedures manual is the third in a series of technical manuals intended to provide clear, technical guidance on the various stages of implementing a Reduced Impact Logging (RIL) management strategy in the lowland and hill dipterocarp forests of Indonesia. This Manual on “Operational Considerations for Reduced Impact Logging”, deals with all operational aspects of the logging activity starting with the opening of the skid trails, through to the implementation of felling and skidding activities. It also deals with the issue of deactivation of the skid trails system as par t of normal operational activities. This procedures manual is the fourth in a series of technical manuals intended to provide clear, technical guidance on the implementation of a Reduced Impact Logging (RIL) management strategy in the lowland and hill dipterocarp forests of Indonesia. This Manual on “Planning, Location, Survey, Construction & Maintenance for Low-Impact Forest Roads”, is technically speaking, not a part of the planning and operational considerations of the logging activities. However, considering the major impact which roads have on the forest landscape and on the values associated with forests, the concept of ‘low impact’ roads is an essential element in improving the overall per formance of tropical forest management. This is a ‘stand alone’ manual. It begins with a discussion of the factor s that result in an excessively high impact of forest roads. The manual then deals with the dif ferent stages in road planning, location, and construction and provides simple guidance on how to mitigate these factor s in order to achieve “low impact” forest roads. This manual is the ﬁfth in a series of technical manuals intended to provide clear, guidance on the implementation of a Reduced Impact Logging (RIL) management strategy in the lowland and hill Dipterocarp forests of Indonesia. 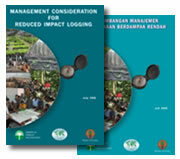 “Management Considerations for Successful Implementation of Reduced Impact Logging”, goes beyond the technical aspects of RIL into the much more crucial domain of Management. This manual provides a synthesis of how the policies and practices of a forest management concession, fundamentally inﬂuences the ﬁnal outcome of the technical aspects of RIL. In this over-arching perspective, the role of Management is of ten the most fundamental and inﬂuential factor in determining whether a forest management unit can succeed at implementing improved forest management as deﬁned by an RIL standard.